On July 24, 2013, the Monday of the Holy Spirit, His Beatitude Theophilos III, Patriarch of the Holy City of Jerusalem and All Palestine, celebrated the Divine Liturgy at the Cathedral of the Trinity in the Russian Ecclesiastical Mission in Jerusalem. 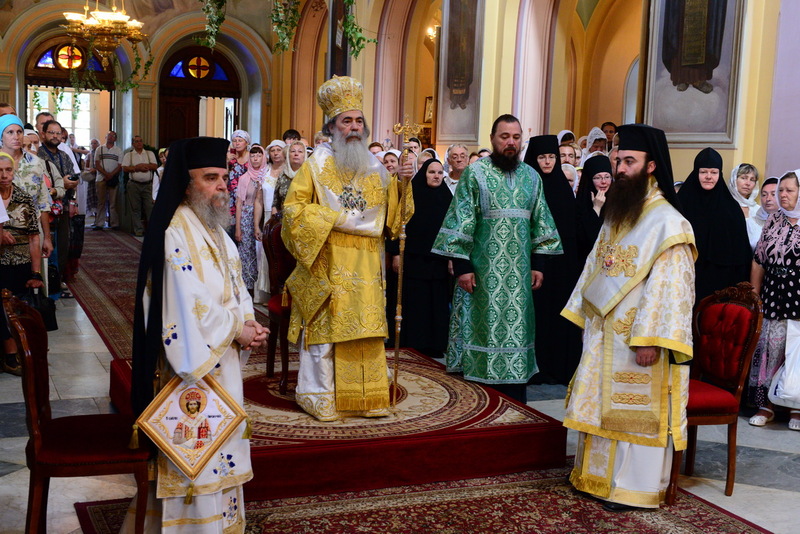 Among his concelebrants were hierarchs of the Patriarchate of Jerusalem, the head of the Russian Ecclesiastical Mission of the Moscow Patriarchate, Archimandrite Isidore, the head of the Russian Church Outside Russia Mission, Archimandrite Roman, clergy of the mission and the Brotherhood of the Holy Sepulchre. The Gospel was read in Greek, Arabic and Church Slavonic. The Head of the Church of Jerusalem presented the Russian mission with a pearl cross as a token of the joint service. Having thanked the Patriarch for his participation in the festive service, Father Isidore presented him with a silver icon ‘Abraham’s Hospitality’ with a particle of the Oak of Mamre. After the service, there was a procession to the Russian mission where a festive luncheon was given to the honorary guests and parishioners. In the evening, a grand reception was given by the mission on the occasion. Present were Patriarch Theophilos with members of the Brotherhood of the Lord’s Sepulchre, mother superiors of the Gorneye and Eleon Convents, diplomats, Israeli officials and others, the site of the Russian Ecclesiastical Mission reports.